This is a limited edition release from the Kilbeggan Distilling Company. 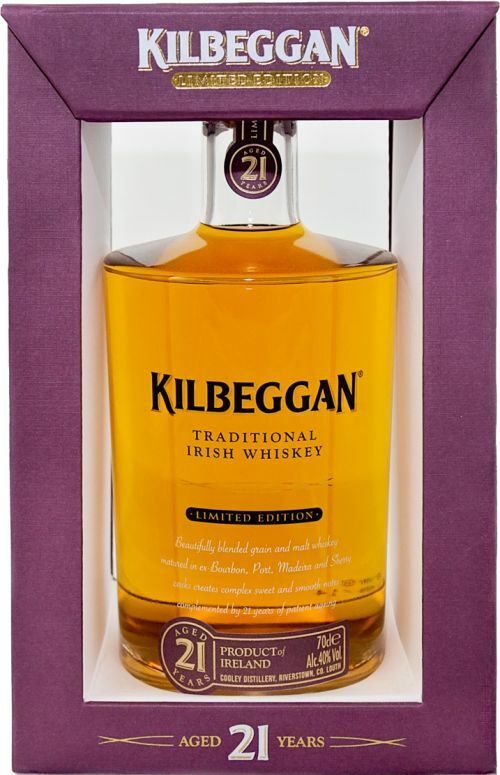 The Kilbeggan 21 Year Old is a blend of grain and malt whiskeys drawn from some of the oldest stocks at the distillery. The components have been matured in a combination of casks including ex-Bourbon, Port, Sherry and Madeira. Nose: A delicate, almost floral start with some fresh, tropical fruits. These are followed by touches of boiled sweets, lemon peel, honey and vanilla. Palate: Delicate and soft but packed full of sweet, fruity flavours. Lemon butter, apricots, pineapple and vanilla to the fore with touches of pear drops and honey. Some sappy, bittersweet oak on the finish.